Todd Gurley was the No. 1 fantasy running back last season. You knew that already. By fantasy points on the ground, he was a clear No. 1 with 203 fantasy points, 21 more than second place. By receiving fantasy points in standard leagues, he was also No. 1 (he was No. 2 in PPR). He’s the first running back to lead the position in each category individually since Arian Foster in 2010, when he had an 87-point lead on second place at the position overall, and man, we don’t talk about that level of dominance enough. I broke down quarterbacks by how they accumulated their fantasy points a few weeks ago, between passing yards, passing TDs, and rushing production. Today, I’m doing something similar. I’m going to look at how running backs put together their 2017 seasons with the use of mutants: Hybridizing a running back and wide receiver to illustrate the level of draft capital you would have had to spend to approximate the production. Austin led the wide receiver position in rushing yardage in 2017 for the third time in four years. He’s finished first or second in all five of his seasons so far. His 33 fantasy points on the ground weren’t much, but they were the same total as Seattle’s Chris Carson, and more than, among others, Thomas Rawls, Eddie Lacy, Terrance West, and Cameron Artis-Payne. In short, Seattle could have used Austin as its running back last year and wouldn’t have noticed much of a difference. Now in Dallas, Austin is apparently going to be used more as a running back in 2018, to the point that MFL has actually reclassified him as a ball-carrier. Behind Ezekiel Elliott, Austin doesn’t have much fantasy value, but in deeper PPR leagues, he’s at least interesting as a depth play. Austin’s former teammate, Gurley, as mentioned above, was the leading fantasy running back in both ground production and air production in 2017. Usually, running backs’ usage patterns go one way or the other — a guy who carries the ball well and sees cursory targets, or a reception specialist who has no choice but to carry the ball occasionally. Gurley and Le’Veon Bell and their ilk are the top tier because they do both, and not many do both as well as Gurley did in 2017. The hybrid: Gurley had 203 fantasy points on the ground, essentially the same as LeSean McCoy (2017 fantasy finish: RB7). Meanwhile, he had 115 receiving fantasy points, one behind Rams teammate Cooper Kupp (WR27). In drafting Gurley, you got an easy running back starter plus a strong flex receiver. I would wager Kamara was either the first or second (after Gurley) name that came to mind after hearing the topic of the piece. He was a surprise to everybody who wasn’t a die-hard Tennessee Volunteers fan as a rookie, finishing just behind Gurley in standard receiving production and besting him when it comes to PPR. 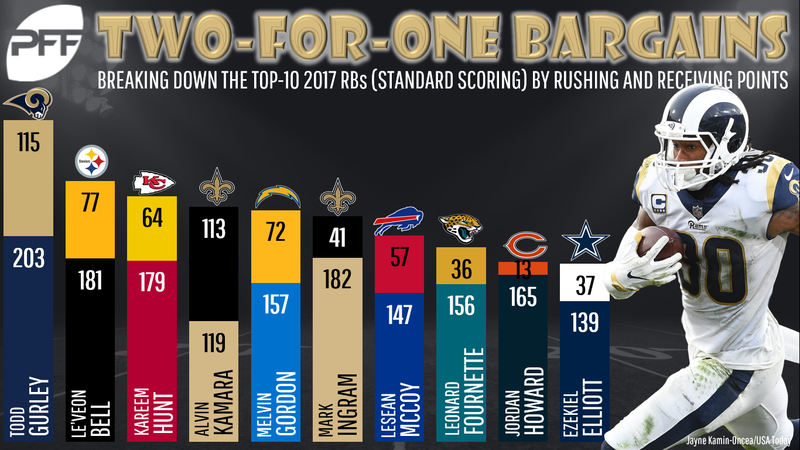 With teammate Mark Ingram missing the first quarter of 2018, there’s every reason to believe in Kamara at least staving off some of the regression demons in his second season. The hybrid: Kamara had 119 ground fantasy points, just behind Javorius Allen’s full total (RB27), while his 113 air points tied Marquise Goodwin and would have been WR28. Sticking with New Orleans, I doubt many people realized that Ingram’s ground-only production was actually second-best in the league in 2017. He put up 182 fantasy points on the ground while offering a still-respectable 41 on receptions. His suspension will hold him down in 2018, but on a per-game basis, he’s still an RB2 candidate. The hybrid: 182 fantasy points on the ground was four better than Jordan Howard’s all-around total of 178, making Ingram an RB9. Adding 41 air points only does so much, but that’s two behind Corey Coleman (WR87), and adding that to an existing No. 1 RB is no small thing. Taking receiving production out of the equation drops Bell from the No. 2 RB slot all the way to … third, only one point behind Ingram. Bell is the comfortable No. 1 overall running back over the last two years, and he’s got to be the betting favorite to be the No. 1 in 2018. Only Gurley and Ingram outscored Bell’s 181 fantasy points on the ground, while only Gurley, Kamara, Christian McCaffrey, and Duke Johnson outscored his 77 through the air. The hybrid: Well, we already said Ingram’s 182 was essentially what Howard did at RB9, so take that production and add in Danny Amendola (WR52) and get a nice bonus. Predominantly, running backs do one job or another. And there’s nothing wrong with that — LeGarrette Blount had the second-most ground points in 2016, added only 4 points on receptions, and still finished as the No. 7 back in fantasy. Ezekiel Elliott bested Blount, didn’t even reach 40 targets, and was only outscored by David Johnson. But the true bell cows who can do both are like the basketball player who can put up a 3 or drive the lane just as well — stop them one way, and they beat you another. And getting the guys who can double down in fantasy is like getting two draft picks in one.